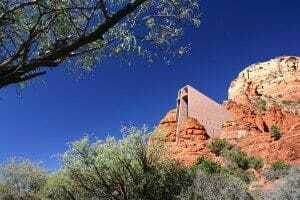 Have a fabulous time in Sedona at the famed Chapel of the Holy Cross, the Roman Catholic Chapel built into the beautiful buttes in Coconino National Forest. This church is run by the Diocese of Phoenix and is part of the St. John Vianney Parish in Sedona, a particular branch established in 1956 upon completion of the building, which was begun in 1932. A local rancher and sculptor by the name of Staude wanted to build something awe-inspiring, which she did with the help from Anshen and Allen Architecture Firm. In 1957 this chapel won the Award of Honor by the American Architecture Association and in 2007 it won the position of one of the "7 Wonders of Arizona" by the state board. When you get to the chapel, you will see how beautifully the church rises out of the surrounding red rocks, a towering cross that gives an awesome panorama of the surrounding buttes, valleys, and the seemingly never-ending Arizona sky. This church serves as a source of inspiration to the community inviting rest and reflection to all who visit. There are great photo opportunities in every direction you look, and inside you will find a gift shop complete with not to be missed, unique religious articles. Purchase your very own personal crosses, rosaries, or native carved stones while you can also choose to participate in a completely optional brief afternoon or evening prayer service! Be sure to wear comfortable and sturdy shoes, as the hike from the parking area to the actual church is a bit steep.